At the end of last month, Michael Klein from 7reasons, Vienna, visited the Visualization Research Center of the University of Stuttgart (VISUS). Within the Lecture Series “Visual Computing“ carried out by the Universities of Stuttgart and Konstanz within the research project SFB-TRR 161, he gave an enlightening talk about the application of computer graphics for cultural heritage preservations. Their clients are mainly museums, cultural institutes and public institutions. 7reasons basically covers the whole setup for exhibitions, starting from modelling ancient exhibits, over producing films, to installing projectors/displays and lighting configurations at the actual exhibtion locations. Michael Klein and his colleagues are using techniques from several fields of expertise – e.g. archaeology, photogrammetry and remote sensing – to model excavation finds, but also still existing architectural objects that need to be preserved. One of their major work areas is the outdoors preservations of the Roman settlement Carnuntum. Here they virtually reconstructed the whole settlement – based on these models actual true to scale buildings in the antique Roman architectural style have been rebuilt. 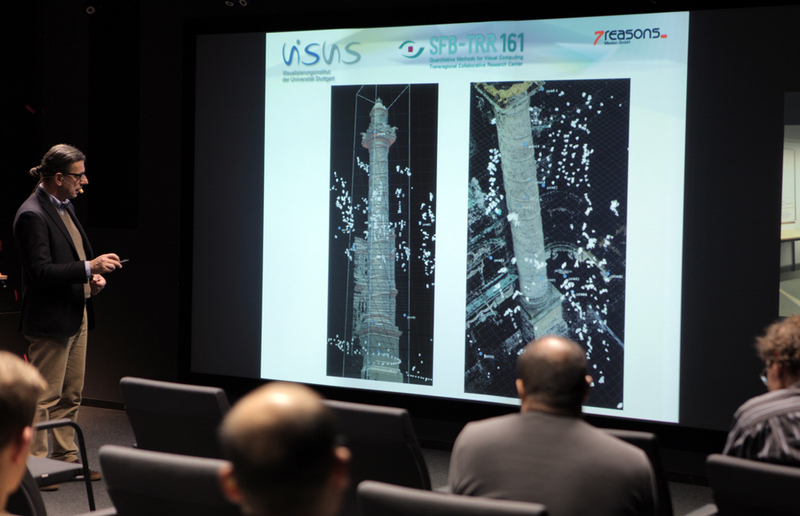 Another example he presented is a case study of the acquisition of parts of the Karlskirche in Vienna, by means of a point cloud obtained by multitudes of images. Michael Klein presenting a virtual reconstruction of the Karlskirche in Vienna during his talk at the University of Stuttgart. Recent years have shown interesting developments in the AR and VR market, therefore a lot of models produced by 7reasons are further processed for the use in AR/VR environments, not only within installation in museums and such but also for handheld portable devices. Patrick Tutzauer is a PhD student at the Institute for Photogrammetry at the University of Stuttgart, currently working on the SFB-TRR 161 project D01 (Perception-Guided Adaptive Modeling of 3D Virtual Cities). His research interests include 3D Building Reconstruction and Modeling.